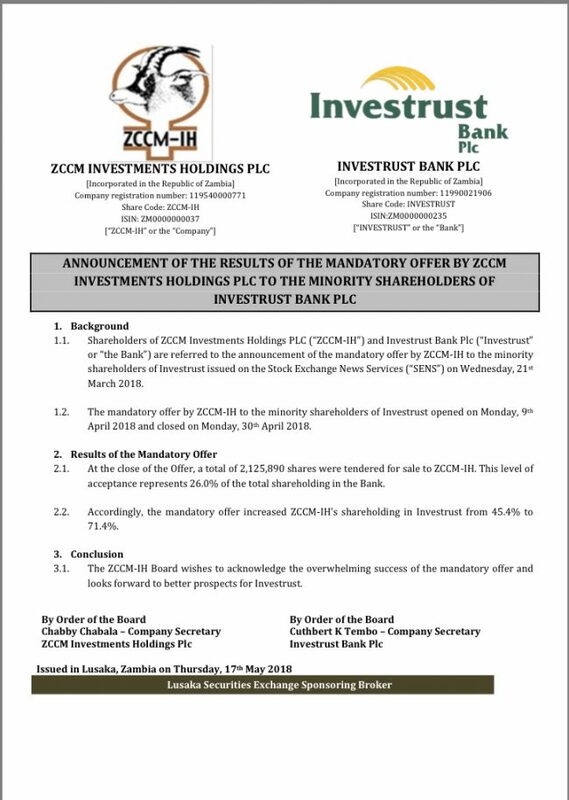 Former president Rupiah Banda and partner Robison Zulu have forced ZCCM Investments to buy shares in Investment Bank Plc. Investtrust Bank is owned by Robinson Zulu and Rupiah Banda using proxies. Investrust Bank Plc is the same bank that has failed to meet the minimum capital requirement by the Bank of Zambia. According to a statement of its final results for the period ending December 31, 2017, Investrust, who incurred losses of K37.9 million last year, down from K47.6 million in 2016, partly driven by its reduced net fees and commission income, among others, disclosed that it fell short of the Bank of Zambia’s (BoZ) minimum capital requirement by K53 million.